Company profile-V V Silks, as a manufacturer & supplier of Silk/Blended Fabrics, Fashion Scarves & Accessories.V V Silks Product Range in fabrics and Scarves. 100% Silk,Polyesters, Cotton, Polyester blends, Poly viscose, silk,Linen, 100% Linen, Silk Lurex,Wool, Silk/blended etc. 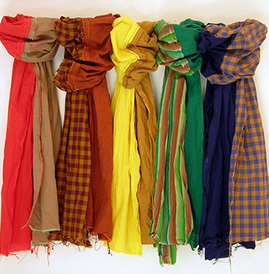 V V Silks, as a manufacturer & supplier of Silk, Silk/Blended Fabrics, Fashion Scarves, Silk Sarees, Linen Sarees & Accessories. The company has its own weaving and processing facilities. We have custom made manufacturing. Our goal is to supply the quality products to our customers with very best prices/fast delivery in this competitive market. Along with catering to international market, we also render our service to domestic market and provide Pure silk fabrics, Natural silk fabrics, Linen fabrics, and latest designed made-ups. These fabrics can then used to make Cushion Covers, Tablemats, Scarves, Clothing, Bedspreads, Curtains and many more accessories depending upon the need. VV Silks is backed by over 20 years of experience in the manufacture and export of the richest, most exquisite silks, permeating even the most competitive and testing markets. Since its inception the company has carved a special niche in the market by serving the customers and global markets with excellent quality products. From conceptualizing to customizing a design, from improvising to implementing weave structures and techniques, our design team will work closely with you to create fabrics that capture the essence of our brand. With a team that is consistently trained to keep their talents at par with global aesthetics you can be assured of achieving your design goals through uncompromising artistry and technical quality.